Hurricane Joaquin has finally left the Bahamas and is now comparatively racing toward the northeast. 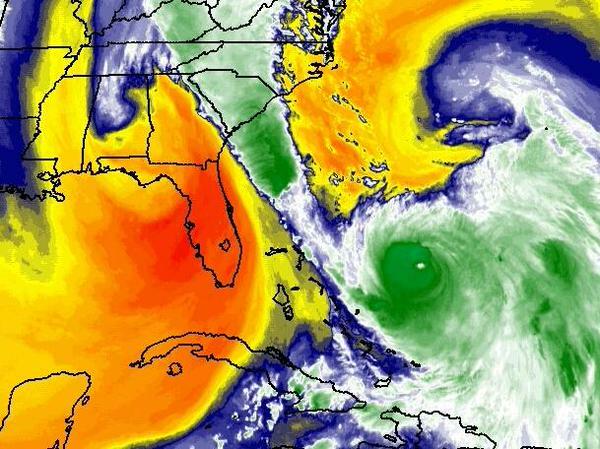 In compliment to the theory that Joaquin upwelled cooler waters in the Bahamas, as Joaquin began moving this morning it began to rapidly intensify to near category 5 status. Communication to numerous islands is still hard to come by and fly over surveys are beginning to be done. It may take a few more days to begin to get a taste of the impact that Joaquin has had on this island nation. I have put together a video of Joaquin passage through the Bahamas over the last 3 days, and at the end of the loop you can see the eye shrink from 30 miles across to less than half of that. This likely also contributed to the intensification phase. It is also likely that divergence over the system and to the northwest associated with the upper level low and trough may have accelerated. The would accelerate the in-up-out flow through the hurricane and could have assisted with the intensification. Over the last few hours, Joaquin has maintained a small eye that remains covered over. The central dense overcast has been displaced to the southeast and outflow has been displaced over the eastern semicircle. Shear has increased over the last 6-9 hours as noted by the more ragged appearance. It appears that the weakening phase has begun although the quasi-atmospheric river will continue to impact the Carolinas. An amazing horizontal and vertical game of Jenga has led forecasters on the hunt for correct solutions, and finally today most models are finally coming together well after most of the damage has been done. According to Tribune242.com, at least one person has died on Long Island with more unconfirmed reports of deaths on the southern end of Long Island. Communication portions or all of Crooked and Long Islands, Rum and Cat Cays, and San Salvador remains largely fractured or entirely disrupted. A ship traveling through Hurricane Joaquin has gone largely missing since Joaquin entered the Bahamas. One life ring was found earlier today from the El Faro, but the large ship has not been spotted by searches from the US Coast Guard. Hurricane Hunters have found winds of 145 mph and a pressure of 945 mb in the 9 pm hour. Thankfully the upper level low and associated surface front that kept Florida and more populated areas of the Bahamas from more impacts will continue to steer Hurricane Joaquin toward the northeast. Unfortunately the higher confidence forecast brings Joaquin to just west of Bermuda. 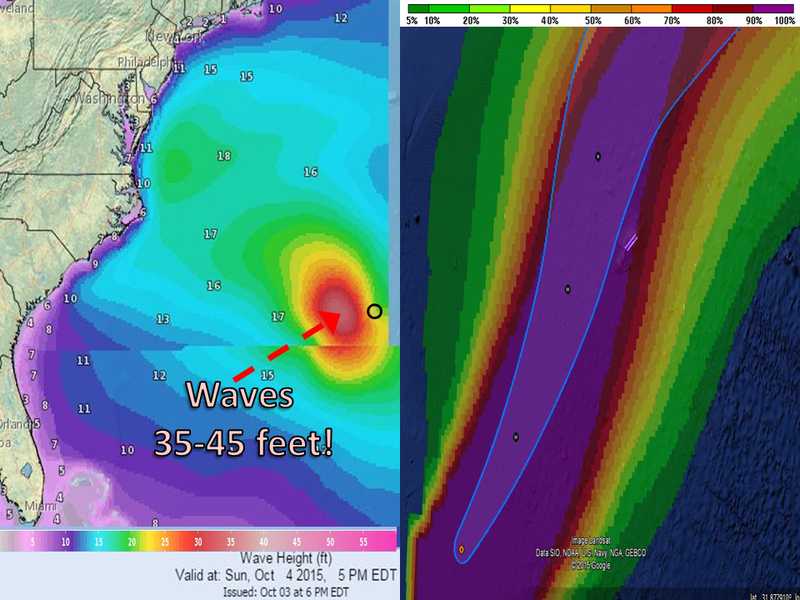 Joaquin is forecast to bring 20ft waves or higher to Bermuda and is anticipated to bring tropical storm force winds. Currently Bermuda has a 13% chance of winds exceeding 75 mph, but these chances could increase if Joaquin nudges eastward. NHC has a forecast track as of 8 pm that would bring Joaquin’s center within 90 miles of Bermuda late tomorrow or early Monday. Waves just west of Bermuda are expected to exceed 35 feet tomorrow evening. A hurricane watch and tropical storm warning is in effect for Bermuda. Preparations should be rushed to completion by early tomorrow. 3-5″ of rainfall will come to Bermuda with Joaquin as it passes by. Should Joaquin nudge closer to Bermuda, wind speeds could be in excess of 100 mph. Currently, the forecast is for winds between 40 and 55 mph. The highest wind speeds will occur tomorrow afternoon into the early morning hours on Monday. Left: Forecast significant wave heights in feet. Right: Probabilities that winds greater than 40 mph may occur. As you can see in the image above, seas are expected to be elevated to 10-15 feet from South Carolina to Massachusetts throughout tomorrow and likely into Monday. Onshore winds from the Carolinas southward will turn offshore as Joaquin gains latitude. This will allow the harbors to empty out some from the extreme rainfall totals today. Charleston Harbor reached its seventh highest level in recorded history, but those levels will be dropping tonight with ebb and flow with above average tides. Gale force winds are possible tonight and tomorrow off shore from Virginia to Maine in typical nor’easter fashion. These winds will drive waters ashore on northeastward facing beaches. Fast moving currents and rip tides are probable along much of the east coast. Be a bore this weekend, and keep your butts on the sand. Another very wet day is anticipated in South Carolina rotates to a W-E or perhaps SW-NE orientation over that state. Today, locations from south Charleston to the North Carolina/South Carolina border and inland to the Piedmonts exceeded 3″ with some reports of more than a foot already reported. Similar to the flooding north Tampa Bay this past summer, it will take some time for this water to decrease. Run off, mudslides, and road collapses are possible if not probable over the next few days with all of this water. As always, turn around don’t drown. Hurricane Joaquin is moving toward the general area of Bermuda tonight and will bring very high seas, tropical storm conditions, and moderate amounts of rainfall over the next 36 hours. Similar could be said for the east coast of the US with a high chance of excessive amounts of rainfall in the low country of South Carolina. Seas should subside from south to north over the next couple of days. Please stay safe, and stay out of the water. Posted on Saturday, October 3rd, 2015, in Severe Weather, Tropical Weather. Bookmark the permalink. Leave a comment.